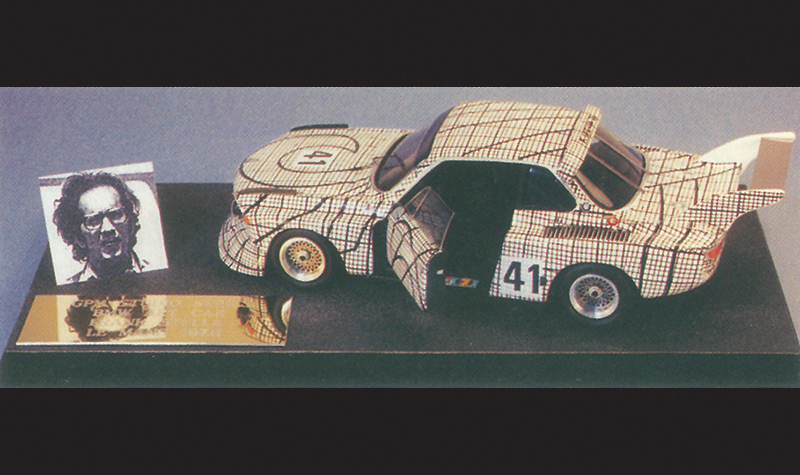 The BMW Art Car began with a simple idea in early 1975. Paris auctioneer and sometime car racer Hervé Poulain had a notion to compete at the LeMans 24 hour race. Not just compete, but compete in a car that was a rolling work of art. This was a very radical idea in the world of motorsport. The commercial era of auto racing was in its infancy. Until 1968 or so, many cars still competed around the world in their national paint colors: red for the Italians, white for the USA, dark green for the British. Sponsorship of racing cars hadn’t even been fully developed by 1975, yet here was this guy wanting to toss the sponsor dollars for art! Poulain had many friends in the art world. Chief among them was Alexander Calder, famous for his painted work and hanging mobiles. His use of primary colors (red, blue, yellow) was lauded around the world for its pleasing style. Calder accepted Poulain’s call to decorate a racing car. Pitching the idea to the relatively new BMW Motorsport entity, they quickly agreed. BMW would get massive attention in both the art and auto racing worlds. BMW was still honing their image as driver’s cars in 1975, when sedans were considered un-sports cars. To race one of their cars at LeMans, decorated by a world famous artist, would no doubt focus attention their way. And sell cars. 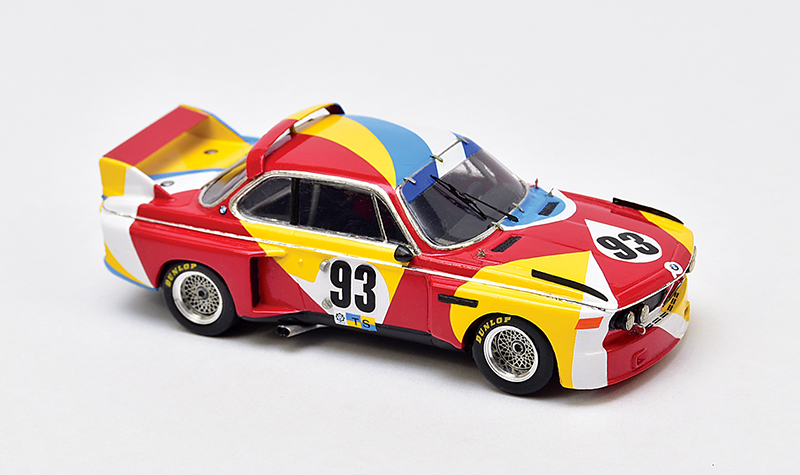 BMW chose the 3.0 CSL car, the “batmobile”, for its winged appearance. This was an appropriate choice for Calder, since he had decorated an airliner in his trademark primary colors in 1973. After Calder roughed out the design on a large scale model of the car, the actual paintwork was turned over to Walter Maurer, a specialist autobody painter in Munich, Germany. Finished in May of 1975, the car was premiered at the Louvre in Paris, and then shown in Munich as well. The real show was at LeMans in mid-June. Entered by the BMW factory team, the car qualified a very respectable 11th. Driven by Mr. Poulain, Sam Posey and Jean Guichet, it did not finish due to a ruined CV joint. The important thing was that the art survived! The next year, BMW came back with another CSL model, although this one had a turbo 6 cylinder engine. 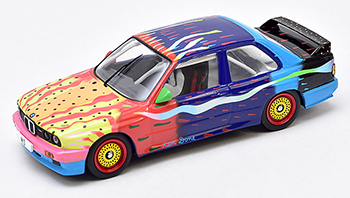 It also featured revised bodywork, and a paint design by commercial artist Frank Stella. Its design was one of graph paper covered by markings of design tools such as French curves, used in technical drawings. A vision in black and white, the car lined up for the race in 8th spot. Driven by Brian Redman and Peter Gregg, the car did not finish, with excessive oil consumption the culprit. Poulain was listed as the third driver, but did not get in the car during the race. 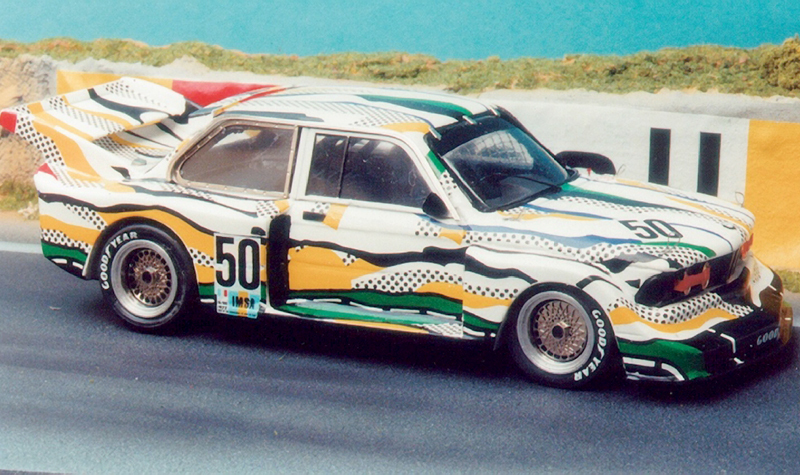 Subsequently, another BMW Art Car, a 320i, was decorated by Roy Lichtenstein and raced at LeMans in 1977. Poulain got to drive this time, and the car finished too, in 9th place. In 1979, one of the most valuable race cars ever painted was created. The artist was Andy Warhol. Interestingly, Warhol was the one to make contact with Poulain, wanting to do a car project. 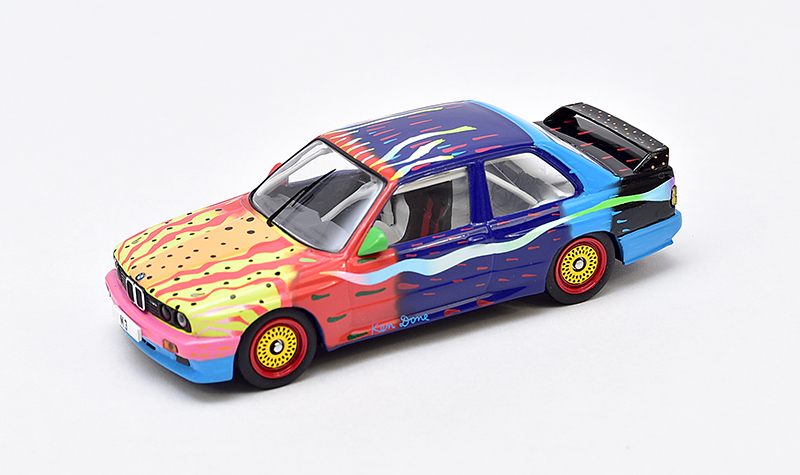 After 3 attempts at a design, BMW approved the third and Warhol went to Munich to personally paint the car. 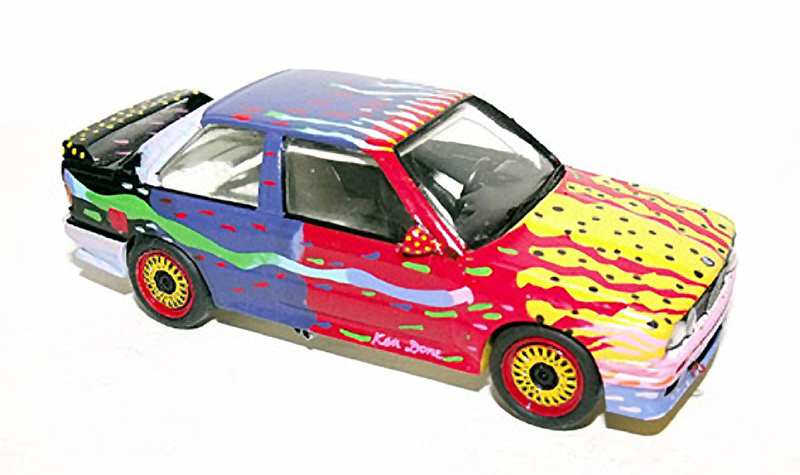 After working out the design on a model car, the full-size car was painted. In just 28 minutes, dipping right into gallon cans of paint using large, crude paint brushes, he splattered on specially created colors in huge sweeping motions. Brush strokes, Warhol’s fingerprints, and his signature are all ingrained in the paint. It’s said that BMW hired a cameraman to film the painting of the car, but Warhol finished painting the car before the cameraman could set up his equipment! The car did not qualify well at LeMans that year. Heavy rain fell during the race, but the car finished a fantastic 6th. This would be the last race Hervé Poulain would drive in a BMW Art Car. But not art cars totally; that’s a story we’ll discuss another day. 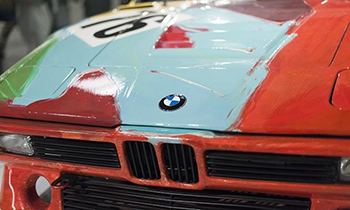 After the Warhol car, the real-world value of the BMW Art Cars became shockingly apparent to BMW. No longer would the priceless art created on cars be risked in a race where they might be damaged or destroyed altogether. So, with Ernst Fuchs‘ 635CSi in 1982, the cars were going to be street car based, direct from BMW’s production line. While a racing V12 LMR Art Car was created for 1999 by Jenny Holzer, it took just one ceremonial lap around LeMans before the race. 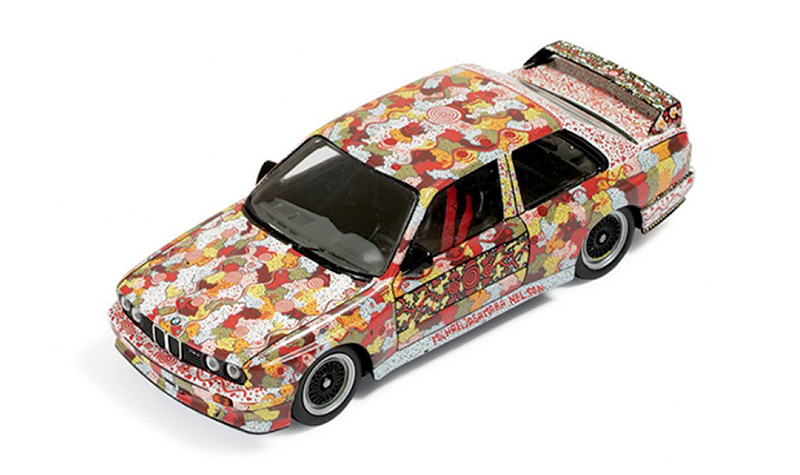 Ten more Art Cars would be decorated until a racing return to LeMans in 2010 with an M3 created by pop artist Jeff Koons. Again the car did not finish. A flat tire had caused the car to limp back to the pits early on, but the car continued. You have to believe that BMW retired the car a little later on, rather than risk damage to the art. 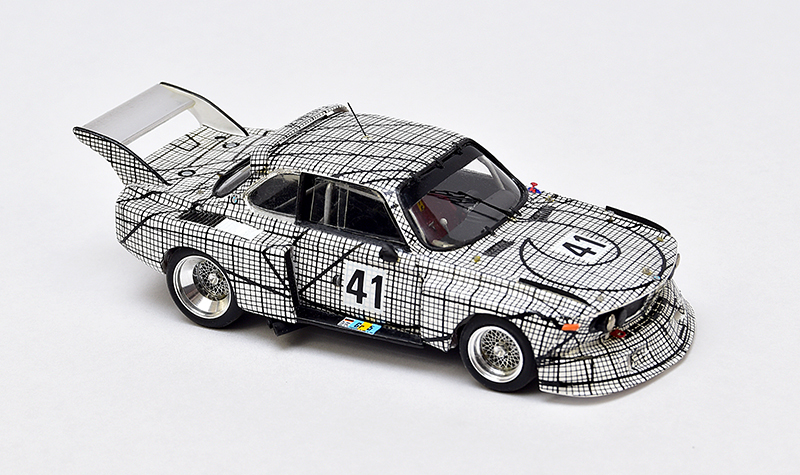 There are now a total of 18 factory-commissioned BMW Art Cars. 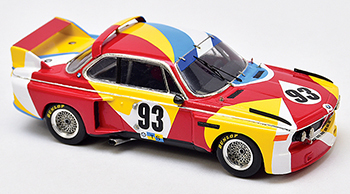 BMW, with Minichamps, have produced almost all of the Art Cars in 1:18th scale for their Museum Series. You can find them online at Ebay. The models have become quite collectible and somewhat rare. The story is quite different in 1:43 scale. There are some models, but you’re going to have to look hard for them. Several cars have been produced as kits. The Calder, Stella and Lichtenstein kits came from Provence Moulage. The Warhol comes from Renaissance and is still in production. 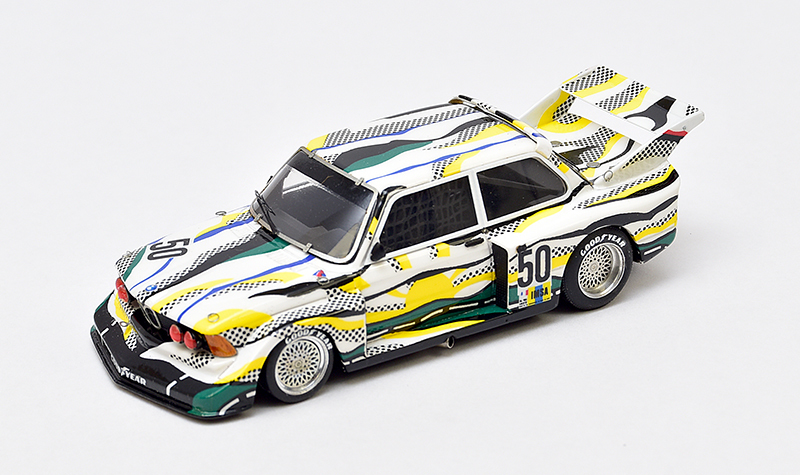 A kit of the Lichtenstein car is available from Renaissance/Elite. Contact Grand Prix Models for more info on the Renaissance/Elite kits. The Provence kits come up on Ebay from time to time as well. 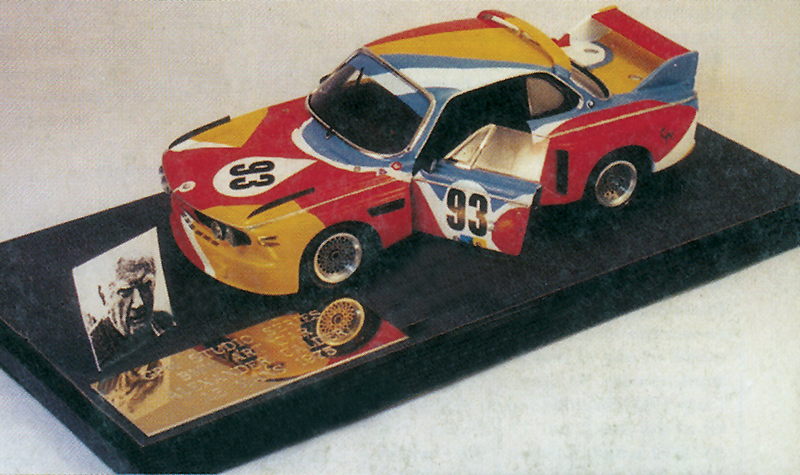 A Portuguese company called FP Project seems also to have produced the Calder car in the 1980s. BBR has produced a very good kit of the Jenny Holzer V12 LMR. Minichamps brings a good diecast of the same subject. Both can be found on Ebay. Provence Moulage also offered factory-built versions of the Calder, Stella and Lichtenstein cars. Harder to find than a unicorn. Competition 43 has done the Sandro Chia car. It’s quite rare and quite good. IXO released both the Ken Done M3 (right) and the Michael Jagamara Nelson M3 as diecast models. Pretty good models, easily obtained. “The Calder, Warhol, Nelson and Chia cars were all handpainted by Peter Cambell, who used to be one of our builders. Stella and Lichtenstein were based on Provence Moulage and Renaissance kits respectively. The Done car used Renaissance-created decals, working with a Meri base. Renaissance also created the decals for the Penck, which used a Baymo base (we still have a stack of these decals). Holzer was made for us by BBR. All were in very limited runs. It is a long time since we did the last one and I can’t remember the numbers; I think it was 10 of each. The Ken Done car had no limit to the issue; they were simply built to order. “We didn’t do any of the 5, 6, 7 or 8 series, as there was no suitable base kit to work with. We looked at doing the 6s with a Jemmpy base, but the bodies weren’t quite right. GPM printed many extra decal sheets for the Ken Done car, and they have been used by Australian Automodelli Studio. Using a Jemmpy kit base, the Automodelli kit requires a two-tone base paint under the decals. Many thanks to the folks at Grand Prix Models for their help with this article. 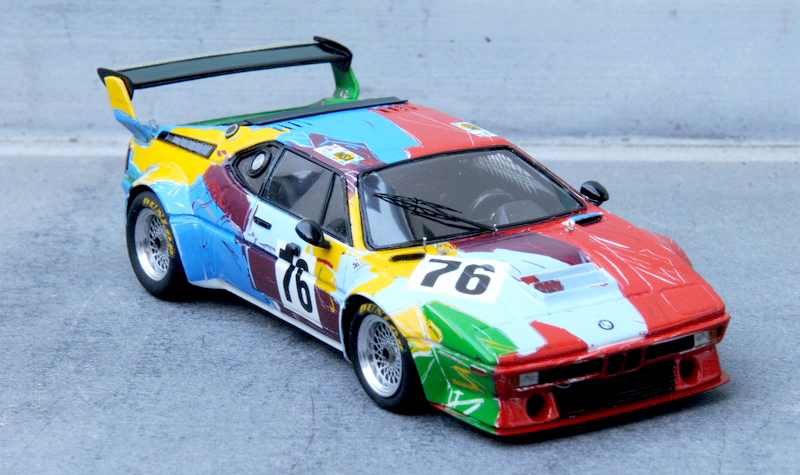 A related story from The New Yorker about the Stella BMW Art Car, questioned the legitimacy of the car as art. Silly New Yorker!